Technically it’s still fall here in Minnesota. But I’m currently looking at snow on the ground and my kids have already made numerous sets of snow angels in the last week. So I’m bringing us back for a hot second to that little glorious bit of fall we had before the white stuff started. Maybe where you are it’s still all red and gold and pretty. This post is a little bit fall and a whole lot of pretty. Clare contacted me a few months ago to recreate a couple special arrangements for her one year anniversary. She sent over a photo of the original wedding bouquet and boutonniere as well as a photo of her wedding cake. Clare wanted a recreation in silk flowers of just a small cluster of flowers made to match the bouquet and boutonniere to use for their anniversary. With pictures in hand, I got to work. Here is our lovely couple on their wedding day. 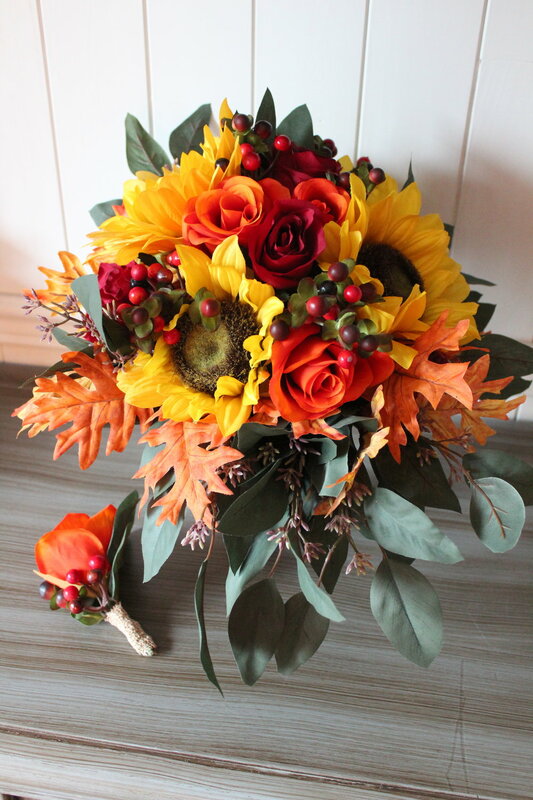 You can see the beautiful variety of fall flowers in the bouquet and how that was mirrored in the groom’s boutonniere. 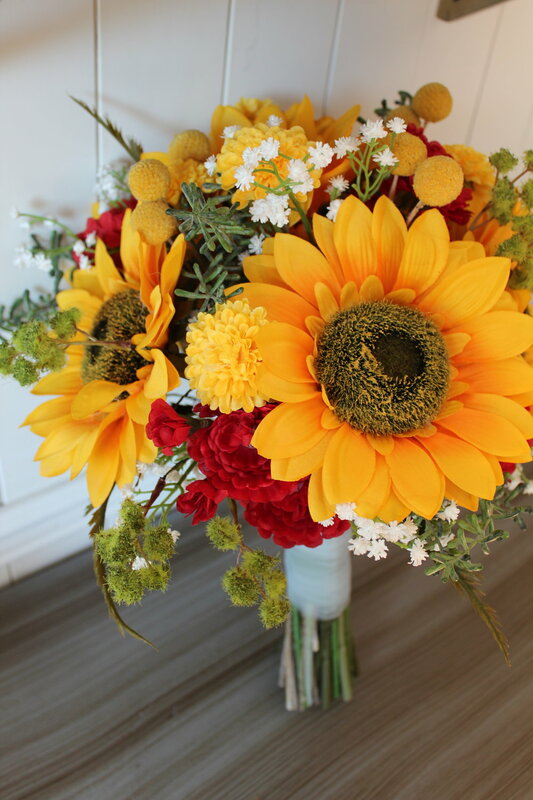 There were Sunflowers, Hypericum Berries, orange and red Roses, Seeded Eucalyptus, and fall foliage. We added burlap to both arrangements for that perfect rustic touch. Thanks to Clare for allowing me to help recreate such a special day for you! If you are interested in having a bouquet, boutonniere, or any other arrangement from a special day, contact me today! 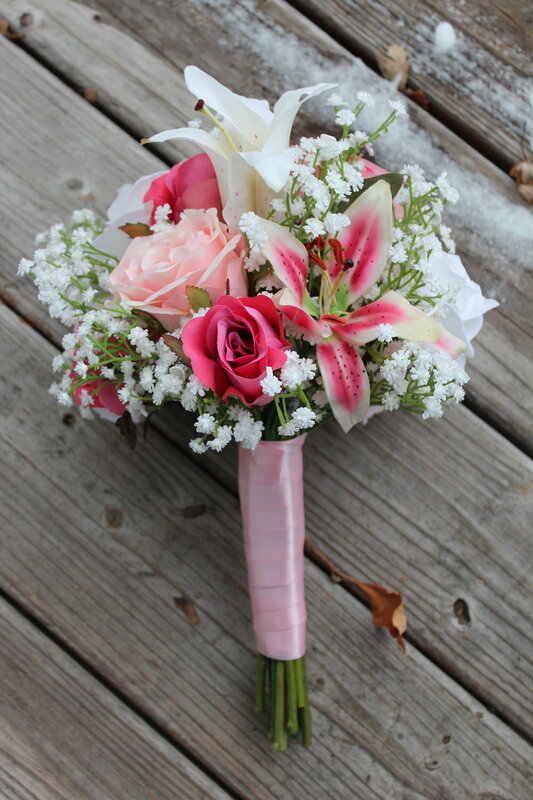 Justin’s wife’s bouquet was a simple mix of Lilies, Heather and greenery. The beautiful gold bow really set it apart. 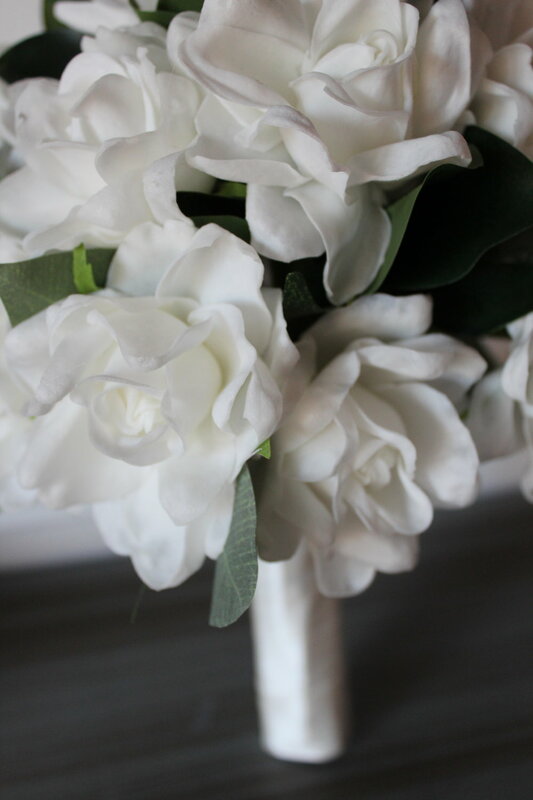 When I sent Justin a preliminary photo of his silk wedding bouquet recreation, he felt like it was missing the Lily buds and enough greenery around the bottom. So with a little tweaking we got it just right. Take a look! 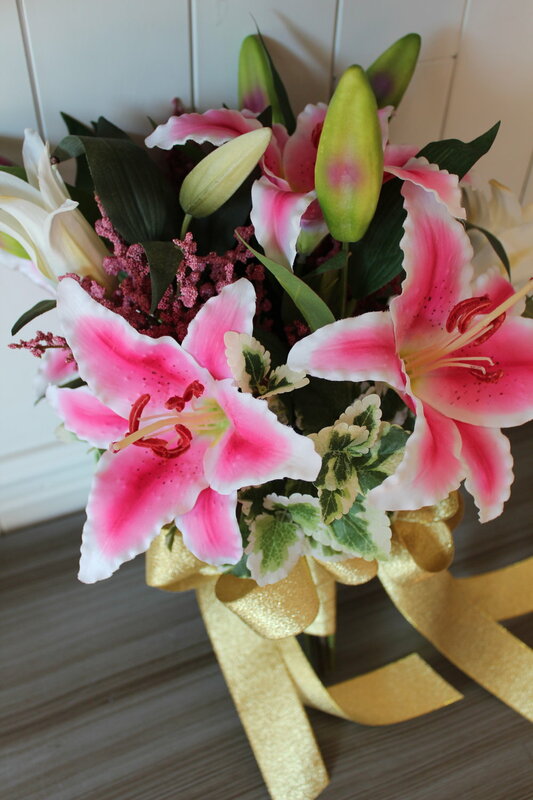 Lilies were a popular flower for recreations in September! 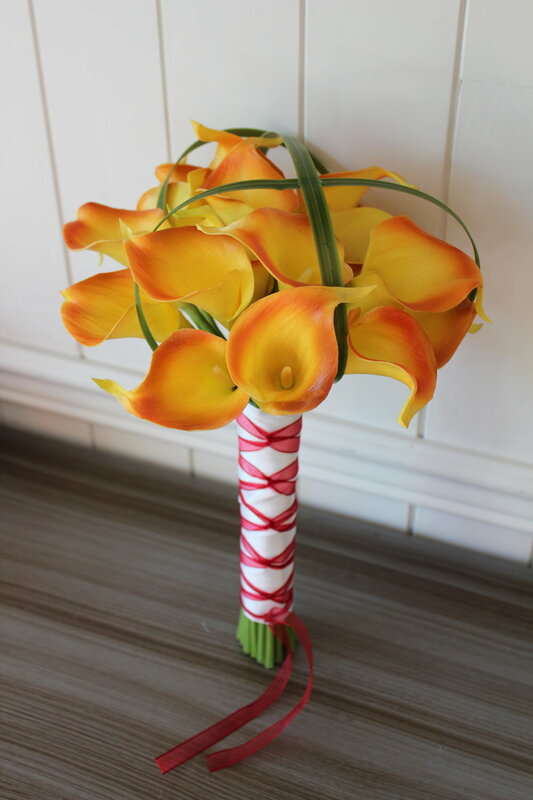 Check out last week’s blog post to see another example of a bridal bouquet recreation that incorporated Lilies. 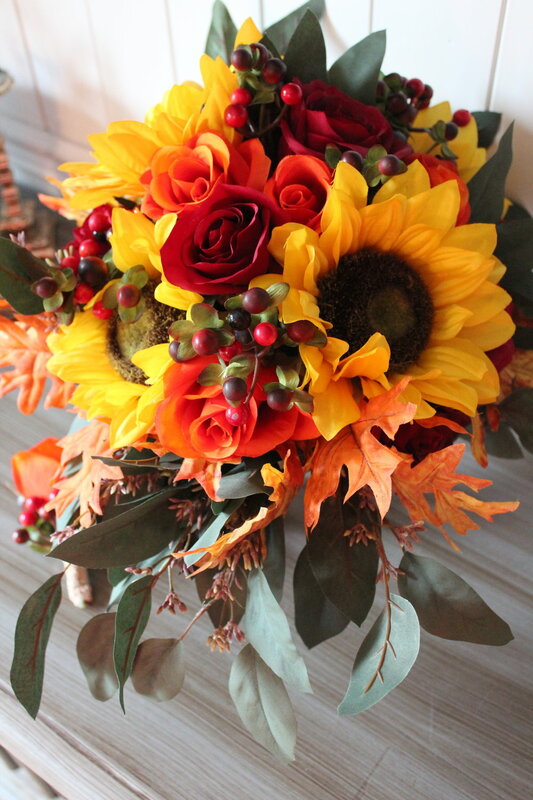 Contact me today for a free quote for your bouquet recreation! 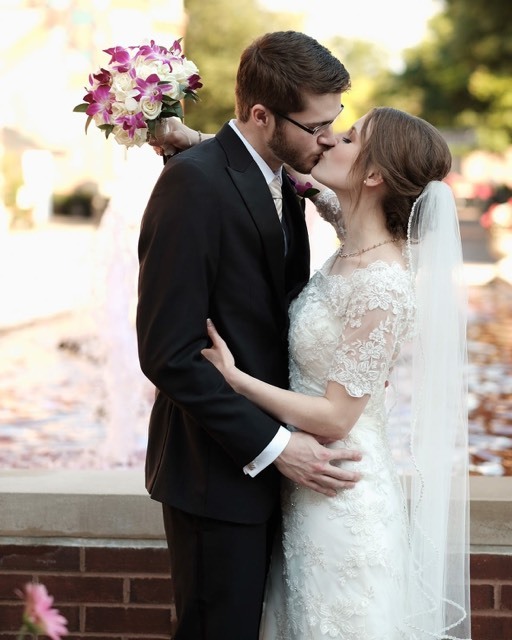 Jordan emailed me photos of his wife’s beautiful wedding bouquet. He mentioned that he didn’t think it was the most wide variety of flowers, so we worked especially hard to get all those other details just right. 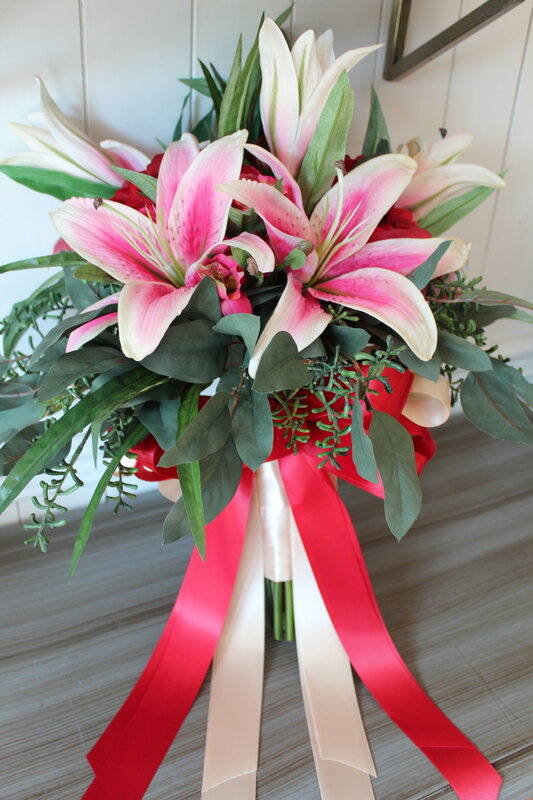 Lilies, Alstroemeria and Roses were the only flowers in the bouquet, but a tropical mix of greenery and that amazing bow shaped it up into an awesome bouquet recreation! Recreations are a great way to give a thoughtful gift to someone you love. I can help with that! Here is the original bouquet. Photo by: Carl’s Rainbow Photography. The bouquet was a mixture of pink Gladiolas, dark purple and lavender Irises, Waxflowers, yellow Mum, Hypericum Berries, and Roses. 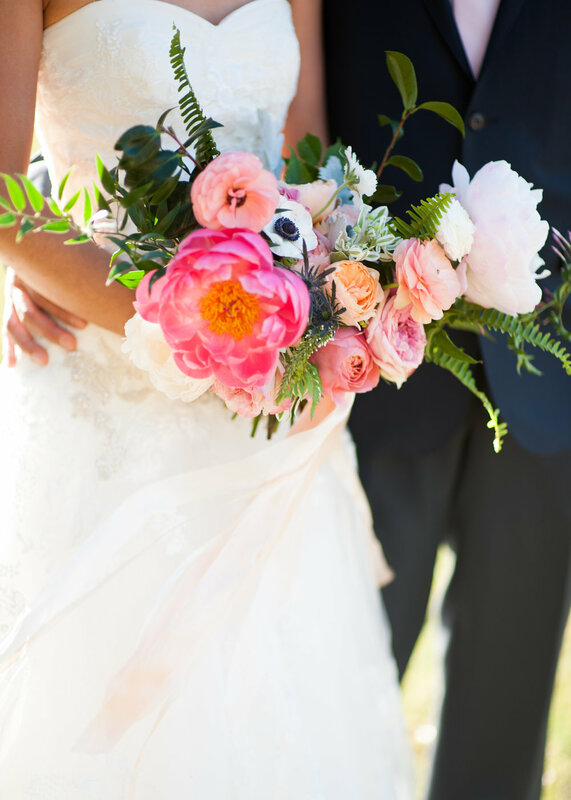 Curious if your bouquet can be recreated? Contact me today to find out! Jonathan contacted me just a couple weeks before his anniversary and wanted to have his wife’s bridal bouquet recreated with silk flowers. He sent me a couple photos and we got to work discussing how to make it happen. 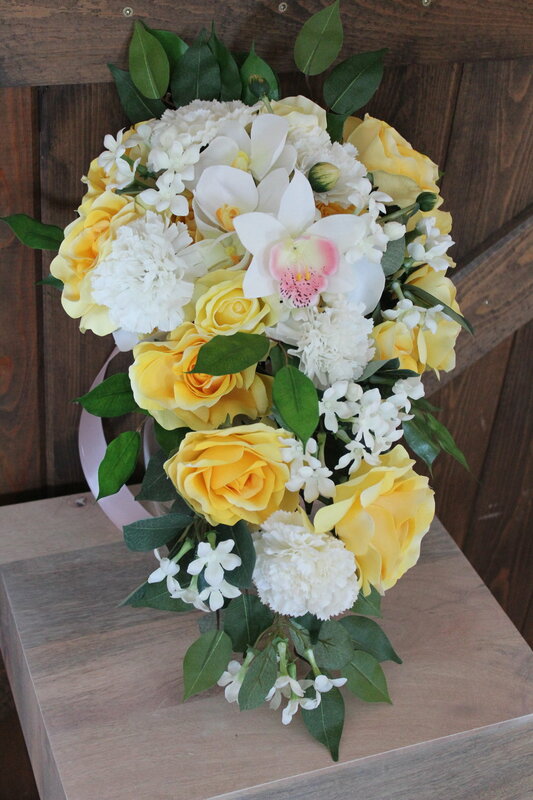 One thing to consider when having a bouquet recreated is the original shape. In this case, the bouquet was a long, teardrop, cascading bouquet. Because Jonathan planned to display the bouquet in a vase after he gave it to her, I suggested that keep the overall look of the bouquet with the same flowers as the original, but reshape it to be fuller at the top with a smaller tail. 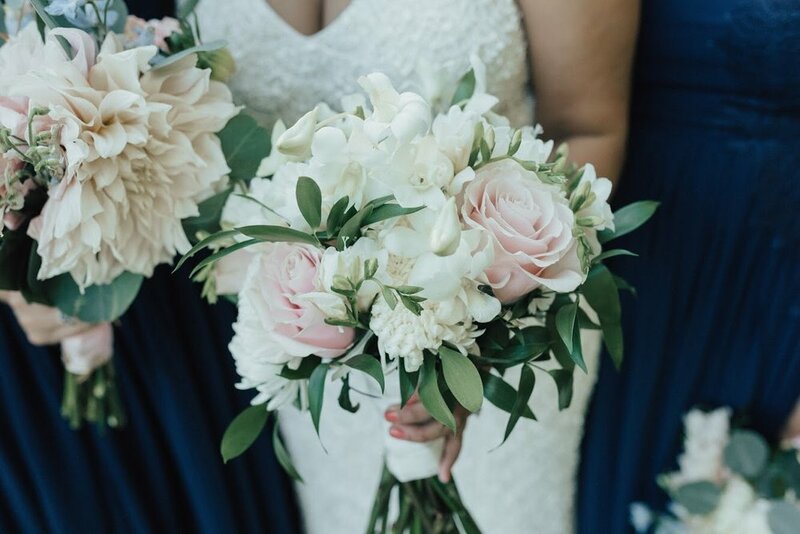 This gorgeous bouquet had white Dendrobium Orchids, pale pink Roses, and ivory Roses. This picture shows how we maintained a cascading shape with the ability to be placed in a vase and still look similar to the original. If you feel like your bouquet was amazing but not the right shape to be displayed in vase, contact me to find out if it can be reshaped for a lifelong, quality anniversary gift.